By Jeff Bulmer - Phoenix Alumni · March 26th, 2019 at 4:46 p.m.
Zachary Levi is electrifying as DC’s latest superhuman. Featuring a teenage main character stuck in the body of an all-powerful superhuman, “Shazam!” is a self-aware movie that leans into superhero tropes almost as much as it lampoons them. Though familiar in concept, the acting, writing, and directing come together to deliver a hilarious and heartfelt story that’s sure to remain a highlight of DC’s Extended Universe. “Shazam!” starts with the problematic child Billy Batson (Asher Angel) moving in with a new foster family in Philadelphia. Ever the loner, Batson initially has trouble accepting his new family, though he quickly finds a friend in foster-brother Freddy Freeman (Jack Dylan Grazer). Batson’s life is further complicated when, during an attempt to run away from his new foster home, he meets the dying wizard Shazam (Djimon Hounsou), who declares him the “Champion of Eternity,” transforming Batson into the Superman-caliber hero Shazam (Zachary Levi). Rather than employ a by-the-numbers origin story, “Shazam!” explores what two 14-year-old boys would do if one of them was suddenly given god-like power in the body of an adult. Throughout the first half of the movie, we see Batson visit a gentleman’s club, buy alcohol for himself and Freddy, and show off his new superpowers as a street act. 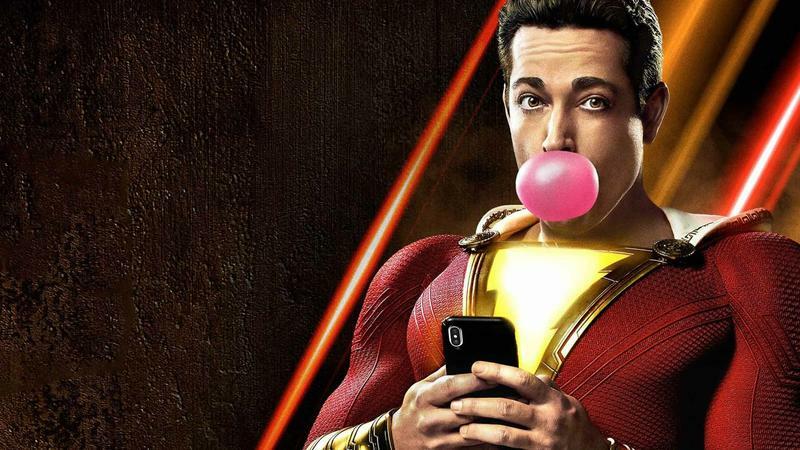 On the rare occasions Batson is tested as a hero, it’s usually a smaller threat – a mugging, pushing someone out of the way of a car – Levi and director David F. Sandberg do a great job of showing just how unprepared Shazam is in his new role. Shazam hides like a scared child during a gas station holdup. After arriving at the scene of an impending bus crash ,he just waits, uncertain of how to proceed. Shazam’s helplessness despite his invincibility is humanizing, and at times genuinely concerning. Levi’s performance as Shazam is the best of any DC character since Christopher Nolan’s “Dark Knight.” Shazam is believable as a pubescent boy in a grown body, right down to his cocky attitude and immature sense of humor. Levi’s comedic timing doesn’t hurt either; “Shazam!” is chock-full of hilarious, perfectly timed one-liners. Grazer also stands out as Freddy, an attention-seeking superhero superfan with a limp. Freddy idolizes and lives vicariously through his superpowered foster-brother, positioning himself as a “superhero manager.” Levi and Grazer have excellent on-screen chemistry and seeing the two bounce jokes off each other and interact for the film’s visual gags is the best part of the movie. “Shazam!” is rounded out by a stellar supporting cast, including Hounsou as the indignant wizard Shazam, as well as Grace Fulton, Ian Chen, Jovan Armand, and Faithe Herman as Batson’s other foster-siblings. Mark Strong also stands out in the role of an admittedly clichéd villain, Dr. Thaddeus Sivana. While Sivana seems at most points a generic bad guy, he ties in well to the story, and his backstory is developed in such a way that he elicits real empathy from the audience. Finally, writers Henry Gayden and Darren Lemke should be lauded. In addition to delivering consistently funny jokes at lightning pace, believable dialogue from child actors, and believable child dialogue from several adult actors, the pair crafted a heartwarming story. At its core, “Shazam!” focuses on Batson’s relationship with his foster family, and Sivana’s relationship with his biological family. These two stories lead to some excellent interactions between Batson and Sivana, as well as both characters and the supporting cast. Well-written, well-acted, and well-directed, “Shazam!” is the best DCEU movie to date. February 22nd, 2019 at 12:25 p.m.